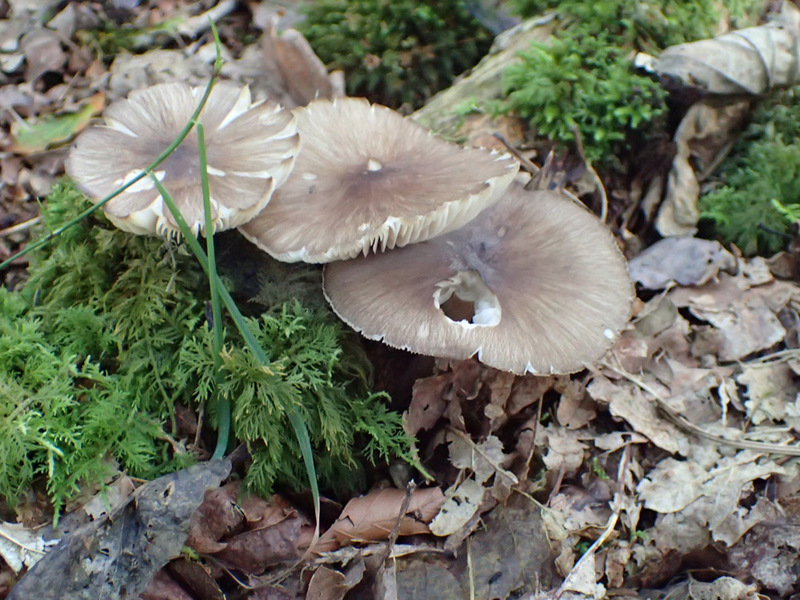 (A) An elevated Oak woodland above the farm. 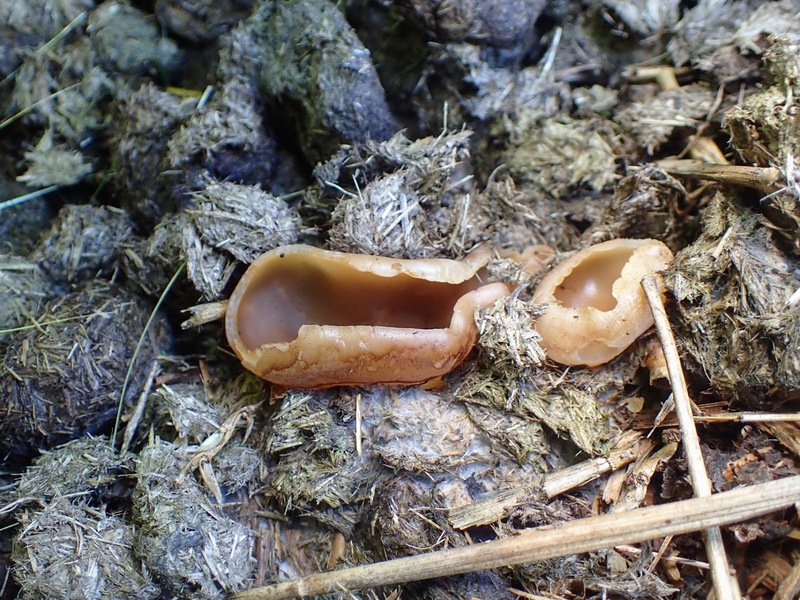 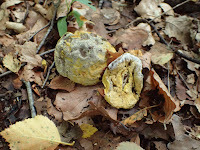 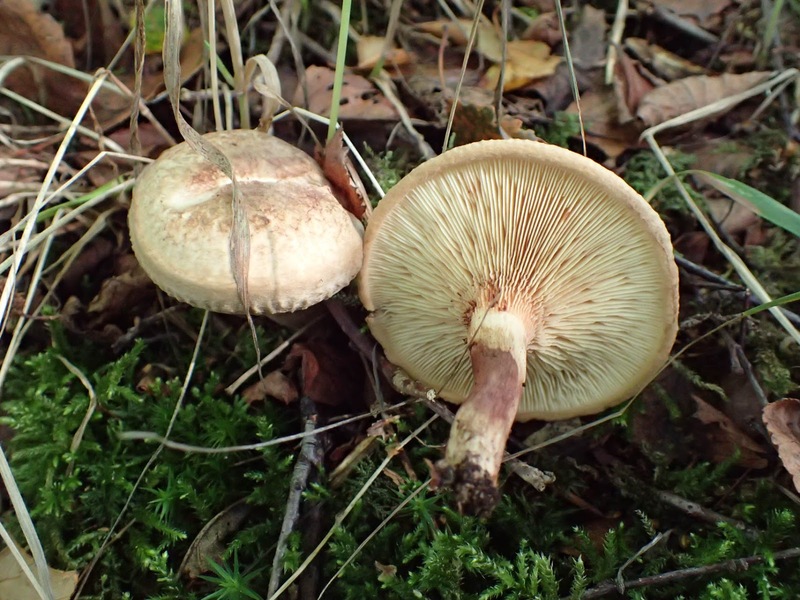 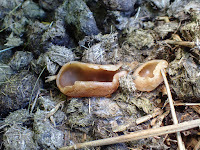 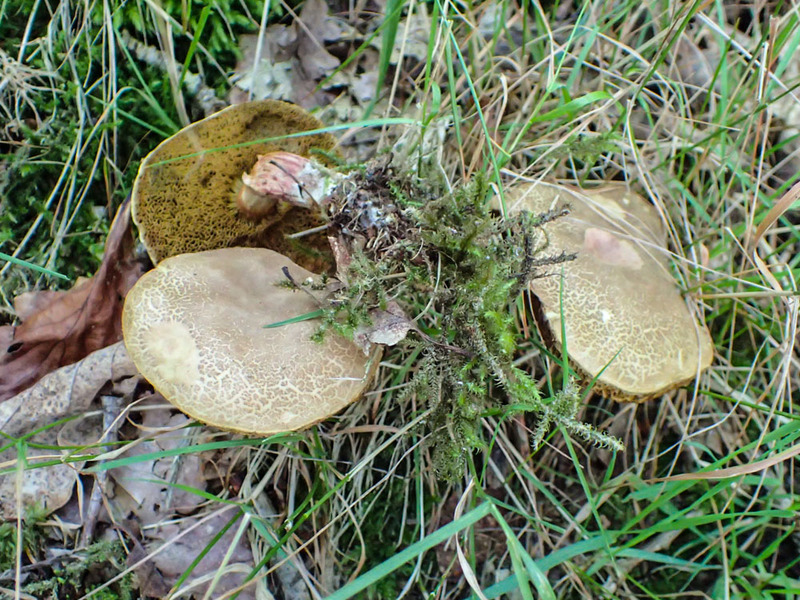 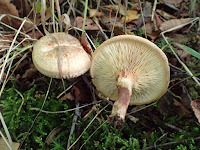 (Both shown above) were found in large quantities all over the woodland. 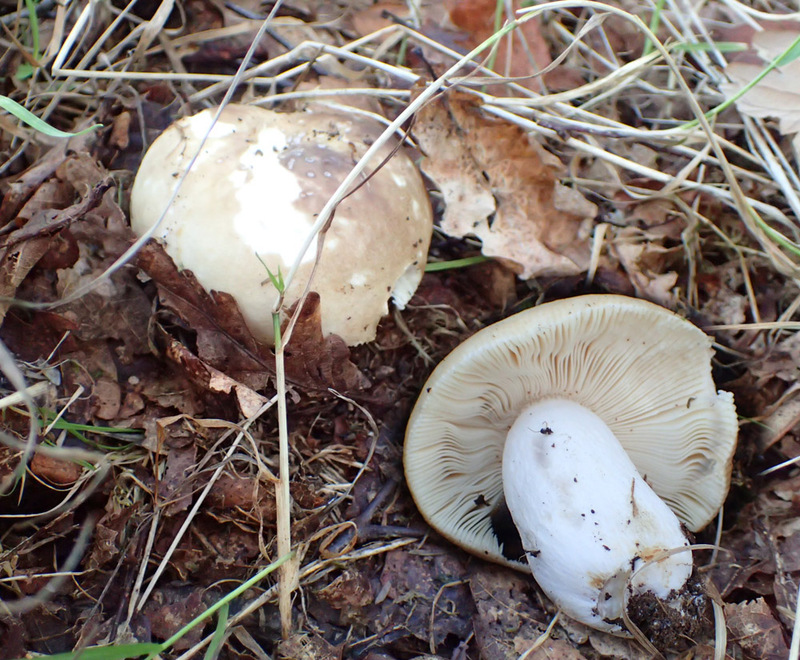 Sulphur Tuft Hypholoma fusiculare and a Russula sp, perhaps Russula amoenolens. 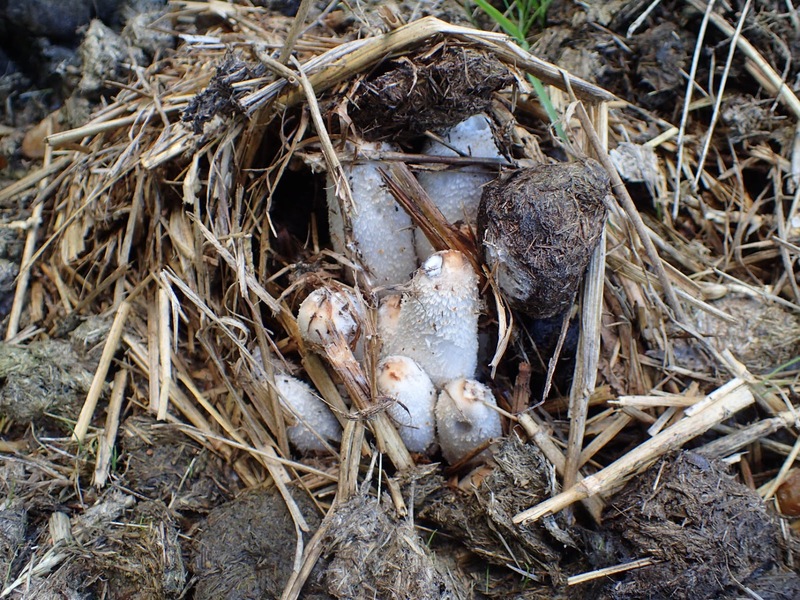 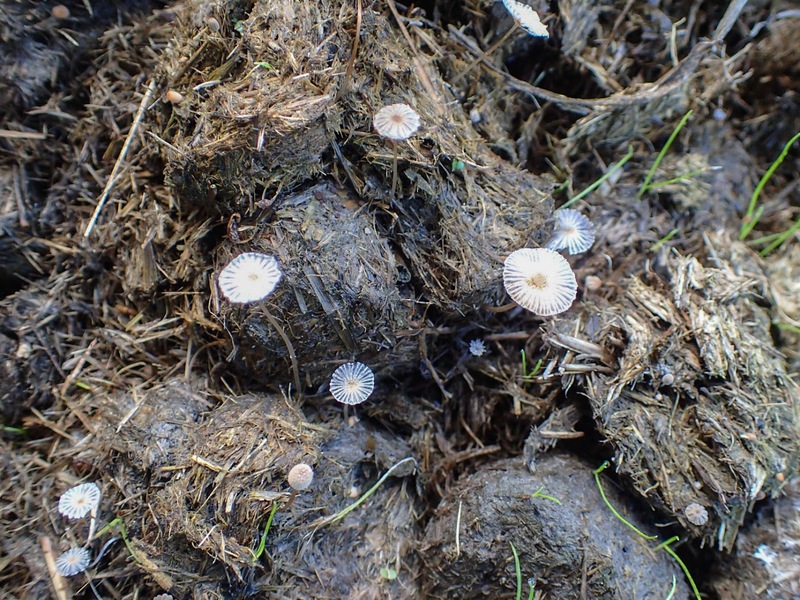 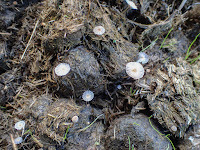 (B) Horse manure pile in yard. A Tarzeta sp and an Inkcap, perhaps Coprinopsis cordispora. 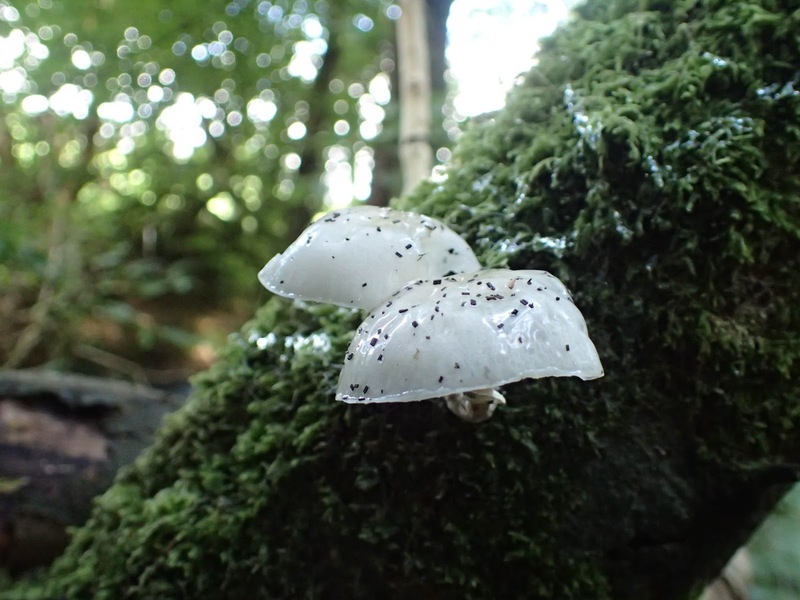 (C) Wet mixed deciduous woodland with stream. 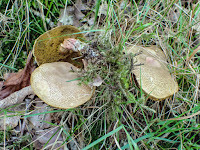 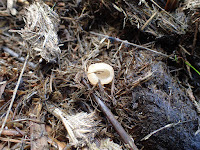 Brown roll-rim, Paxillus involutus and Bulbous Honey Fungus, Armillaria galica. Hypomyces chrysospermus growing over a species of bolete and Beechwood sickener, Russula nobilis. 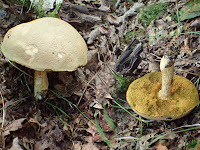 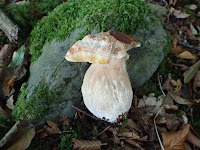 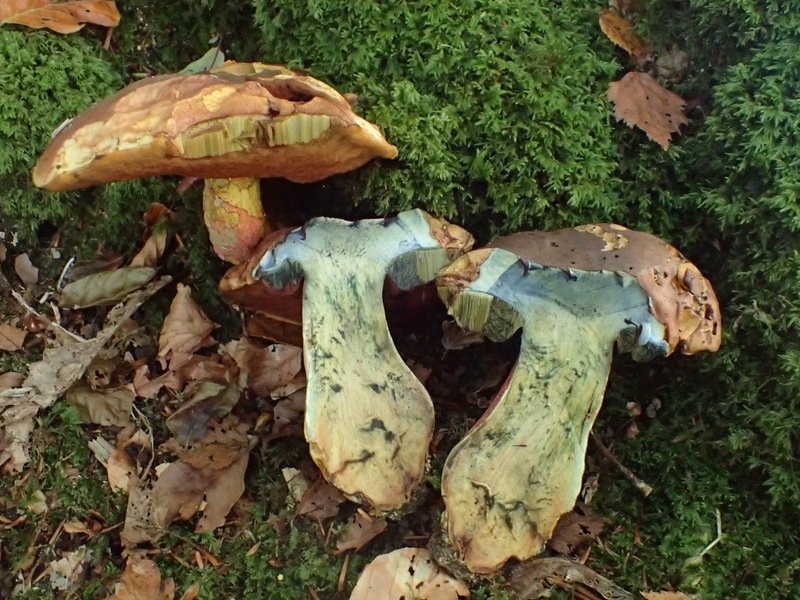 A Cep, Boletus edulis and Scarletina bolete, Neoboletus luridiformis. 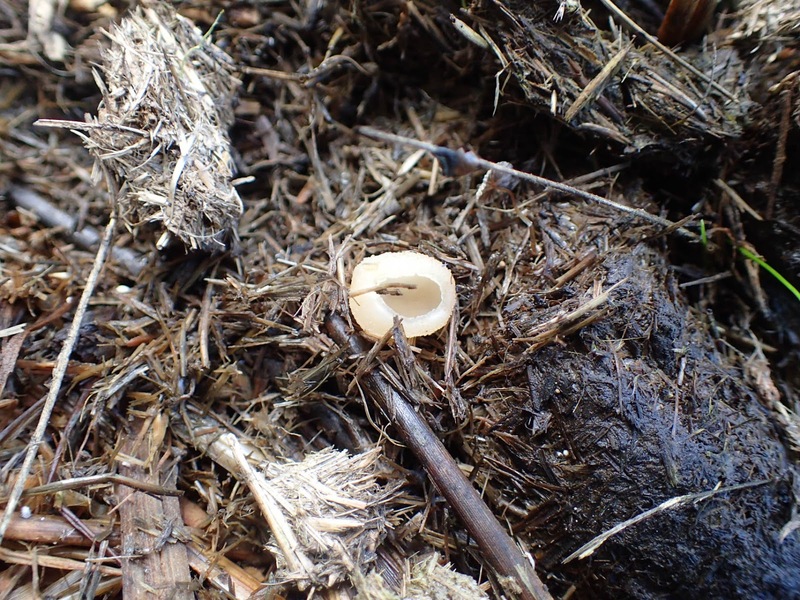 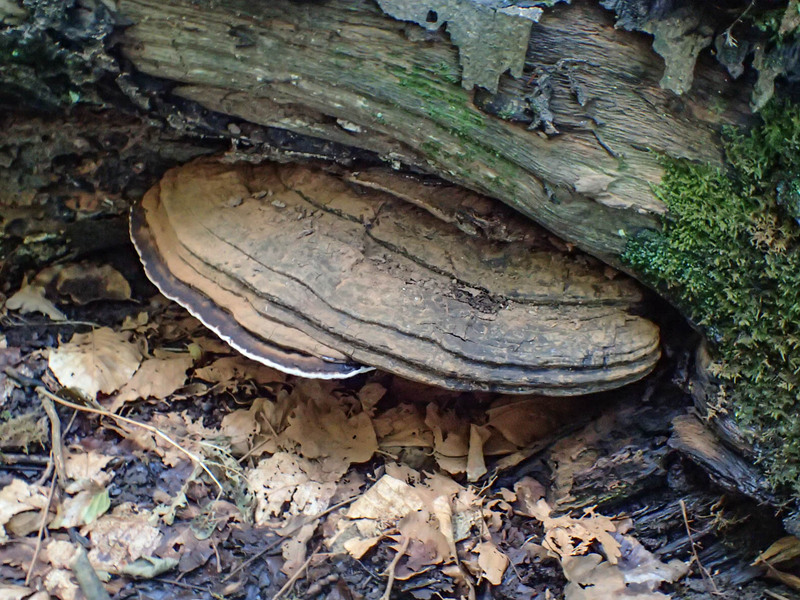 Porcelain Mushroom, Oudemansiella mucida and Southern Bracket, Ganoderma australe. 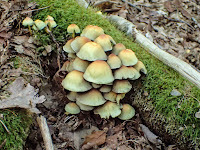 Other species noted in the lower wood were: Turkeytail, Trametes versicolor, Birch bracket, Piptoporus betulinus, Blushing Bracket, Daedaleopsis confragosa, Burgundy Bonnet, Mycena haematopus, Glistening Inkcap, Coprinus micaceus, Hairy Curtain Crust, Stereum hirsutum Collared parachute, Marasmius rotula, Deer Shield, Pluteus cervinus and Sheathed Woodtuft, Kuehneromyces mutabilis. 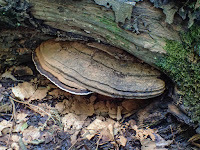 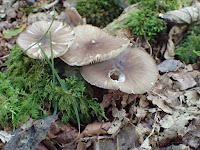 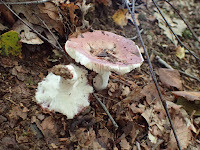 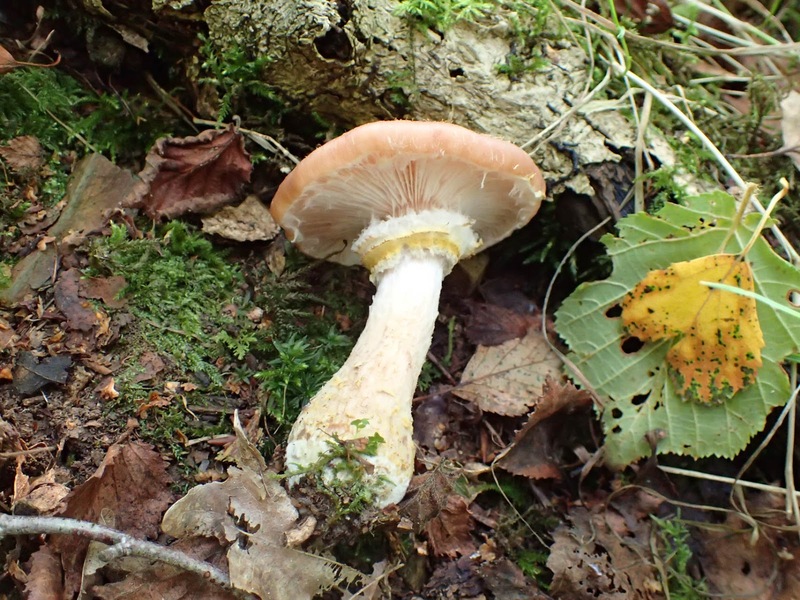 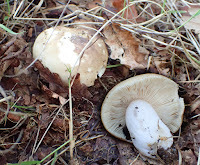 An obvious point to note was that although both woods had many mushrooms, the diversity of species in the lower, wetter wood corresponded to the inceased diversity of trees in this habitat.